Run The Other Way is a story of passion and pain that reminds us of our human frailty and God’s power to redeem us even in the midst of overwhelming odds. In these soul-baring vignettes, Smith takes readers through the emotional chronology of her affair with a married man, giving an intimate and poignant window on the world of a woman whose joy in her professional success was tempered and tainted by her profound and deeply personal struggle. For 20 years, Jan Smith has helped others find their voices, tell their truths, and relate to their audiences. As a highly esteemed vocal coach and producer for chart-topping artists, Jan’s music-world contributions are well defined — from credits on multi-platinum recordings to leadership within the National Academy of Recording Arts & Sciences, appearances with clients on various hit TV reality shows, and consultation with the Chinese Audio-Visual Association in Beijing. But while her clientele has included more than 10,000 vocalists, musicians, and producers — and she has occasionally agreed to live performances of her own — it is through the written word, rather than vocalization, that Jan is now reaching her widest constituency. She has found her voice… is telling her truth… and relating to a large and varied audience with her honest and emotionally compelling memoir, a behind-the-scenes story of love found and lost, of sin and redemption, and of a life transformed. This is one of the boldest things I’ve ever seen anyone do. It is brilliantly poetic, brutally honest, and filled with the grace and mercy that God has for us all. Run The Other Way is an eye-opening reminder that life can turn at any moment, but the redemptive power of God’s unconditional love shines through at our darkest moment. A must read for everyone. With every word in this book, it feels like we are living inside Jan Smith’s broken heart. This is a painful, personal and beautifully written book. We’ve all been there. Jan maps out all the broken roads we’ve all traveled, and she does it with humor and heart. Raw… humorous… humbling. That’s Jan Smith in Run The Other Way. I read the book in one sitting and could not stop. She’s a powerful woman with a successful business, strong family background, and a close circle of friends. The book details her voyage through the “high” of an exhilarating relationship to the bottomless pit of despair, and culminates with a joyful message about redemption and the power of faith. Beyond Jan’s message about how she clawed her way out of despair is a powerful message about friendship and the ongoing need for friends and family to pay attention to those they love, and stay close. 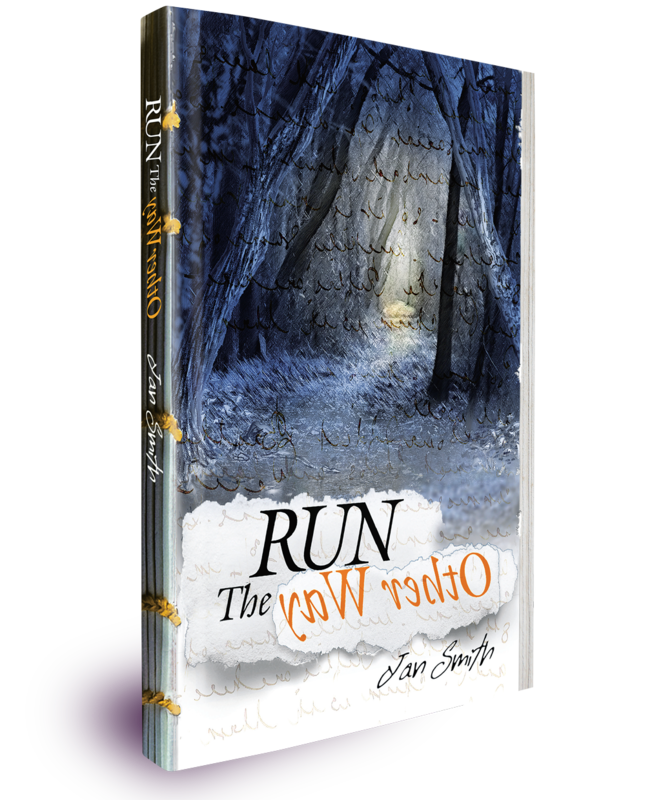 Run The Other Way by Jan Smith is a raw and rare glimpse into the truth behind the effects of sin, and serves as a testimony to the power of God’s unconditional love, salvation and forgiveness — even when we don’t have it within us to love or forgive ourselves. Run The Other Way is for anyone who has ever struggled with moving beyond the guilt and shame arising from sin and who needs to experience God’s love, peace, mercy, and grace! The sheer courage and selflessness it takes to put all of this on paper and release it for all of the world to see is awe-inspiring. Run the Other Way is a raw, gut-wrenching, intimate encounter with a woman who is brave enough to bear the depths of her soul for the benefit of others. As is often the case — the truth ain’t pretty. It was hard for me to get through this book — never have I read and felt a more powerful description of what it really feels like to walk through such darkness and survive. I was relieved to “run the other way” where the power of faith, surrender and God’s grace changes everything. This journey of redemption inspires me to be a better wife, mother and friend. Thank you for a FEARLESS look into the path of a woman of faith. Anyone who knows Jan, knows the honesty that defines her. Her book truly allows her gift of candor to show through in a way that only she can deliver. Her writing is startlingly beautiful, despite such difficult subject matter. When all is said and done, the message of redemption in her writing should give us all the courage to be as honest, not only with ourselves, but with each other. You might assume that Jan Smith’s first book would focus on entertainment — on music, specifically, and the artists she’s mentored on their way to successful careers. Instead, it is a deeply personal memoir — a story of love and loss; of despair and hope; of human fallibility and divine faithfulness. Once you turn the first page, be prepared for the distinct possibility that you may read this entire book in one sitting — and then keep it in mind for many, many weeks to come. Walking into Jan Smith Studios I had no idea of the magnitude impact this woman would have on my life. At a the end of every dark tunnel there is light, and that is exactly the way I must describe Run the Other Way. This incredible book. Many would not be as selfless to open themselves up, to let the “ugly” out and help another, but she has extended herself to the world in this incredible book in order to encourage others. If you are stuck in the middle of your tunnel & looking for a light…I encourage you to please read this book & gift it to others. Thank You Mama J for being a lamp.